Channel Letter Coil | Wrisco Industries Inc.
WRISCO INDUSTRIES INC. can assist your signage channel letter needs with high-quality channel letter coil produced on one of our computerized cut-to-length slitting lines! Prefinished Painted, Mill Finish or Anodized, Wrisco can slit and recoil any color in gauges .032, .040, .050 and .063! Standard stock items – Super Bright White, Black and Bronze are ready-to-ship. Experience for yourself why Wrisco is rated the highest-quality channel letter coil supplier in the industry! Super Bright White on backside of all coils for maximum light reflectivity. All painted channel letter coil is PVC protective masked. 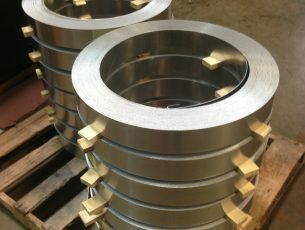 Mill finish coils are unmasked (No PVC). Standard stock sizes .040 x 5.3” x 270’, .040 x 4.3” x 270’ and .032 x 5.3” x 270’. Mill Finish .040 x 3.5" x 270' , .063 x 1.5” x 500’, .063 x 2” x 270’ and .063 x 3” x 270’ is available. 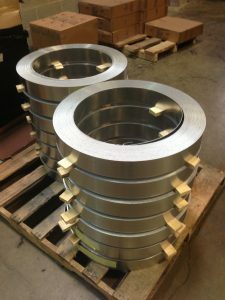 Custom coil widths and lengths – quick turnaround and no surcharges. All colors and finishes available – certain minimums apply, please inquire. Save money – use exactly what is needed – no wasted drop. Save labor time – already slit perfectly to width. Works flawlessly with all computerized channel letter machinery. Save freight – coils can be shipped UPS. Channel Letter Back substrates offered in Painted Aluminum, Mill Finish and Aluminum Composite Material. Matching color painted pop rivets ABS42 and ABS45 are available to finish your letters.